The Scottish Rite was not the only branch of Freemasonry that responded to the needs of men in pursuit of Masonic light. 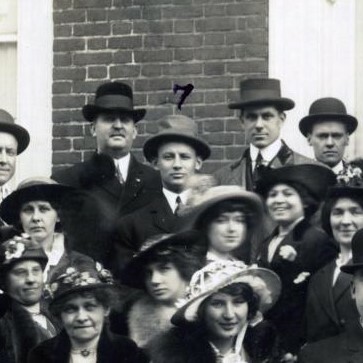 In 1918, the Grand Lodge of the State of Oklahoma appointed a Special Deputy for Camp Doniphan. Lawton Lodge No. 183 had received more than three hundred requests for the degrees of Ancient Craft Masonry. While soldiers were passing through Camp Doniphan, Lawton Lodge No. 183 would confer 143 Entered Apprentice degrees, 214 Fellowcraft degrees, and 207 Master Mason degrees. [iv] Other Lodges across Oklahoma, seeing an increase in petitions for the Degrees of Freemasonry, were granted dispensation for one day degree conferrals for those men who would be entering the service. 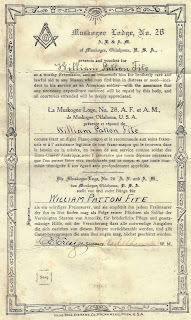 The patent is a stunning example of how Masonic charity and relief can transcend borders. 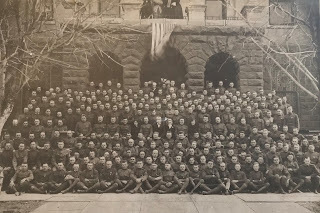 [i] “Camp Doniphan,” US Army Center of Military History, accessed April 30, 2018, https://history.army.mil/html/bookshelves/resmat/wwi/pt02/ch10/pt02-ch10-sec06.html. 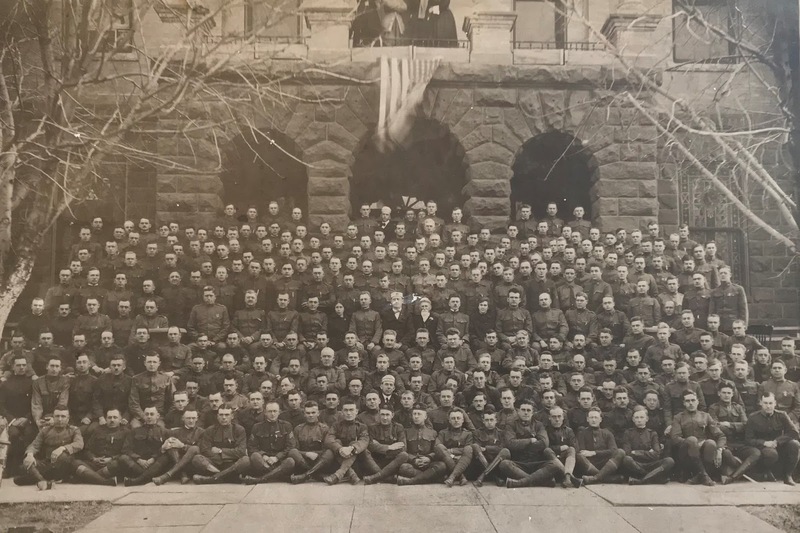 [ii] “World War I,” Fort Sill History, accessed April 30, 2018, http://sill-www.army.mil/History/_wars/ww1.htm. [iv] Proceedings of the M.: W.: Grand Lodge A.F & A.M. of the State of Oklahoma: Tenth Annual Communication (Oklahoma, 1918), 47-48. 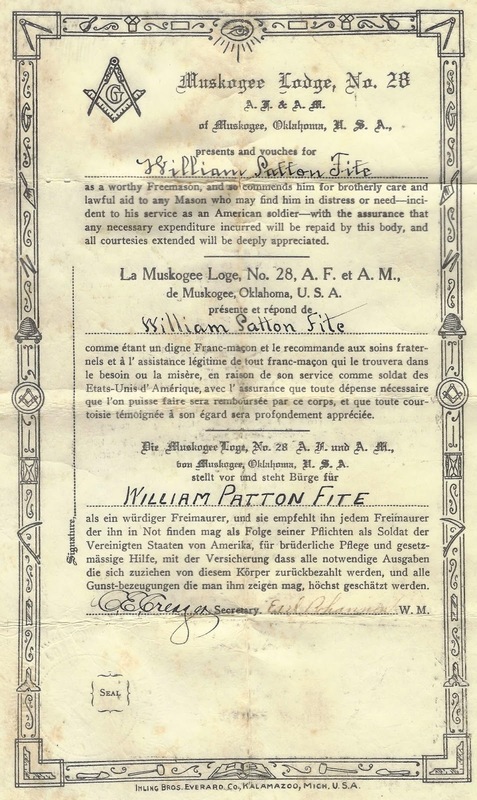 [v] “Fite, William Patton” (member profile, Grand Lodge of the State of Oklahoma). [vi] Liz McMahan, “Fite Family’s Legacy Remains Alive Here Today,” Muskogee Phoenix (Muskogee, OK), June 5, 2007. [vii] John D. Benedict, Muskogee and Northeastern Oklahoma (Oklahoma: S.J. Clarke Publishing Company, 1922), 389.